Cardiac arrest is an emergent condition in which the heart completely stops. The chances of survival are low, even with CPR. 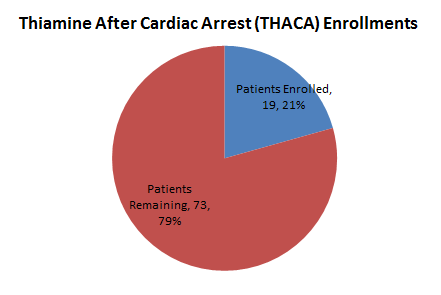 Over 200,000 people per year experience an out-of-hospital cardiac arrest in the United States. Survival rates are low, and even those who survive often have significant brain injury. Unfortunately there are no medicines available to treat this condition. Our prior work suggests that a simple vitamin (Vitamin B1, or thiamine) may help improve outcomes in these patients. Based on our work, the National Institutes of Health has funded a study to test whether thiamine decreases lactate (a chemical that increases in the blood when a patient is in shock from lack of blood flow or inability to process oxygen). We will also test whether thiamine improves the ability of patient’s cells to use oxygen normally, and other blood tests that are markers for brain and other organ injury. This is a randomized, double-blind, placebo-controlled study. This means that when a patient starts the study neither the patient, family nor the research team will know if the patient is getting thiamine or a placebo (an inactive substance, in this case simple salt water). Who is eligible to be in this study? We will include adult patients who are brought to the hospital after a cardiac arrest requiring CPR. How is this study different from many research studies? Because of the importance of administering Vitamin B1 (Thiamine) as soon as possible after cardiac arrest in order to maximize the chance of finding a benefit, this study will be conducted under exception from informed consent (EFIC) in accordance with the federal Food and Drug Administration (FDA) regulations. EFIC is allowed only when testing possible treatments for life-threatening conditions for which there is no alternative proven treatment, when obtaining consent is not possible because the study treatment must be administered quickly and family or healthcare proxy is not reachable. When someone is reachable to provide consent, research staff will obtain consent prior to enrollment. For participants enrolled under EFIC, they or their representatives will be notified of enrollment as soon as possible and asked if they would like to continue participation, with the option to withdraw from the study at any time. All patients will receive standard post-cardiac arrest care per their clinical team, whether or not they enroll in the study. When research is done under EFIC, the study must conduct outreach to the surrounding community to inform them of the study, get feedback on the proposed study and EFIC, and provide a way for individuals to opt out of the study. Based on this response, the IRB has determined that we can move forward. We will continue to take feedback and questions from anyone in the community leading up to and during the trial. Opting out: Any member of the community has the right to opt out if they do not wish to be enrolled in the event that they suffer a cardiac arrest. In order to opt out, a person simply needs to contact our team at Vitaminstudy@bidmc.harvard.edu, or (617) 754-2885, and provide their name and date of birth. A bracelet indicating their wish to opt out of the BIDMC THACA trial will be provided either by being mailed to their home or picked up at the medical center, according to their preference. The study will include all adult out of hospital cardiac arrest (OHCA) survivors admitted to a BIDMC ICU with a lactate above 3 mmol/L. Our overall hypothesis is that the administration of thiamine in post-arrest patients will mitigate lactate acidosis, improve cellular oxygen consumption, and improve clinical outcomes. Lactate change will serve as the primary endpoint for this study. Specific Aim 1: To determine whether thiamine attenuates lactic acidosis, improves cellular oxygen consumption, and increases pyruvate dehydrogenase (PDH) activity in post-arrest patients. Specific Aim 3: To determine whether intravenous thiamine improves clinical outcomes in post-arrest patients. Cardiac arrest is an emergent condition in which the heart completely stops and the chances of survival are low. Over 200,000 people per year experience an out-of-hospital cardiac arrest in the United States. Survival rates are low, and even those who survive often have significant brain injury. Unfortunately, despite the high mortality, there are no medicines available to treat this condition. Our prior work suggests that a simple vitamin (Vitamin B1, or thiamine) may help improve outcomes in these patients. Based on our work, the National Institutes of Health has approved funding for a clinical trial to test whether thiamine decreases lactate and improves other outcomes after cardiac arrest. Thiamine is a co-factor of PDH. Inadequate PDH function and/or thiamine deficiency limits pyruvate from entering the Krebs Cycle and results in lactic acidosis (anaerobic metabolism). We have shown that PDH is inhibited in post-cardiac arrest patients. Lactic acidosis is common, and failure to clear lactate is associated with worse outcome. While we anticipate the benefit of thiamine will be greater in cardiac arrest because of neuroprotection, we note that in a randomized trial in septic shock, thiamine decreased lactate over time compared to placebo and survival over time was improved for those with thiamine deficiency. Thiamine also improved survival and neurologic function in a mouse model of cardiac arrest. We hypothesize that the administration of thiamine in post-cardiac arrest patients will mitigate lactic acidosis, improve cellular oxygen consumption, and improve clinical outcome. This phase II prospective, randomized, blinded, placebo-controlled single-center trial will investigate the effect of thiamine vs placebo on lactic acidosis and PDH in patients who achieve ROSC after OHCA. An attempt to consent a patient’s legally authorized representative will always be made by our study team. Clinical trials for cardiac arrest are very difficult to conduct since patients are too ill to be able to consent for themselves, and it is not always possible to reach family members immediately. To address this problem and allow for ongoing studies to potentially help individuals and communities, the FDA developed a mechanism to conduct research in these types of scenarios. This mechanism, termed “Exception From Informed Consent (EFIC)” allows the study to proceed if the investigators are unable to reach family members for consent. If no one can be reached for consent and a patient is enrolled, repeated attempts to contact family will be made. If the patient becomes able to consent or family is reached after enrollment, they have the option of withdrawing from the study at any time. EFIC requires not only approval from the BIDMC Institutional Review Board (IRB) as standard for all research studies but also requires input from the community through focus groups, surveys, and other community meetings. We have done this community outreach and received overwhelmingly positive feedback. Based on this response, the IRB has determined that we can move forward. The final phase of the process is public disclosure and this is currently being performed through both traditional media and social media outreach. We will continue to take feedback and questions from anyone in the community leading up to and during the trial. All patients will receive standard post-cardiac arrest care per their clinical team, whether or not they enroll in the study. After consent/enrollment, patients will have baseline labs drawn, and will be administered the study drug (placebo or 500mg thiamine) twice daily for 2 days. Blood sample collection: All patients will have blood samples collected at 0, 6, 12, 24, 72 and 168 hours, with testing as detailed below. Primary Outcome: The primary outcome will be the difference in lactate between the thiamine and placebo group. PDH activity: We will compare PDH quantity and activity between groups. Cellular metabolism measurements: we will compare quantitative, real-time, tissue specific cellular metabolism and mitochondrial function between groups, using the XFe96 instrument (Seahorse Biosciences). Measurements of neuron specific enolase (NSE) and S-100B: Serum NSE levels and plasma S100 levels (both markers of neurologic injury) will be compared between groups at various time points. Global VO2 measurements: VO2 will be measured using a General Electric VO2 monitor with gas exchange module, which will be connected to the ventilator tubing via a ventilator adapter with an attached gas sampling line. CPC-E score: The Cerebral Performance Category-Extended (CPC-E) score is a validated, clinically-feasible robust assessment of function and disability, providing more granular detail than the original CPC score. We hypothesize that the provision of beta blockade to tachycardic patients in vasopressor-dependent septic shock will lower the heart rate, thereby improving diastolic filling time and improving cardiac output, resulting in a reduction in need for vasopressor support. To test our hypothesis, we propose a Phase II randomized trial to determine if esmolol decreases vasopressor requirements (primary endpoint) and alters the inflammatory cascade as well as oxygen consumption in patients with septic shock. Given that the compelling finding of a 30% reduction in mortality was the result of a single center European study, we submit that a Phase II pilot study is needed in a U.S. critical care environment, to validate this concept, before a larger, multicenter U.S. trial could be justified. If we find that esmolol does allow for more rapid decrease of vasopressor need over time, without evidence of harm, we will have the necessary and sufficient data upon which to design a larger Phase III investigation aimed at addressing clinical patient-related outcomes. Specific Aim #1: To determine if continuous infusion of esmolol improves the hemodynamic profile in septic shock by decreasing the need for vasopressor support. Specific Aim #2: To characterize the effects of esmolol infusion on the pathophysiology of septic shock. Specific Aim #2a: To characterize the effects of esmolol infusion on total body oxygen consumption (VO2) in patients with vasopressor-dependent septic shock. Specific Aim #2b: To characterize the effects of esmolol on inflammatory markers in patients with vasopressor-dependent septic shock. Severe sepsis and septic shock are the cause of significant morbidity and mortality worldwide. An estimated 751,000 cases (3.0 per 1,000 population) of severe sepsis occur in the U.S. each year, resulting in approximately 215,000 deaths. Septic shock is characterized by cardiovascular dysfunction (most typically systemic arterial hypotension), a hypermetabolic state, and lactic acidosis, potentially leading to death. In addition, the economic burden on the health care system for patients suffering from severe sepsis is striking. Weycker et al. report that patients suffering from severe sepsis will require an average of $45,000 dollars of medical care cost on their index admission and up to $78,500 dollars in the first year post-diagnosis. These figures rival such entities as acute myocardial infarction, trauma, and stroke. Despite advances in critical care and increased awareness of the need for early identification and aggressive treatment of sepsis, morbidity and mortality for septic shock remains unacceptably high. The downstream cardiovascular effects of septic shock, beyond the shock period itself, are not trivial: myocardial depression, tachycardia-induced cardiomyopathy, and direct myocyte toxicity. Novel therapies for septic shock are continually being sought, with a long history of agents which have failed to improve outcomes for these patients, and in some cases, have actually conferred harm. Currently, there is no adjunctive therapy for the treatment of septic shock that has adequately demonstrated an ability to reduce morbidity and mortality. Furthermore, beyond the use of vasopressors and inotropes to support failing hemodynamics, there is currently no specific therapy targeted at the cardiovascular effects of septic shock. Identification of a therapy which could improve outcomes for patients with septic shock, specifically related to cardiovascular dysfunction, would be a major advancement in a field plagued by a history of therapeutic failures. While a recent single-center European trial has shown promise for the use of beta blockade in septic shock, further evaluation is necessary before widespread application of this therapy could be safely and responsibly advocated. However, there are reasonable existing data available to justify moving forward with this line of investigation. Prospective, randomized, double-blind, human clinical trial. Known allergy/sensitivity to esmolol or history of asthma/COPD that would preclude administration of a beta blocker medication; this would be determined by the clinical team caring for the patient so as to not create a conflict of interest. For example, a patient may have a history of COPD but is already on a beta blocker medication as an outpatient; that patient should not be excluded for consideration of enrollment in this trial. The randomization will be done in a 1:1 ratio between treatment and control groups in varying blocks of two to six using SAS software. This main list of group assignment will be maintained in the hospital research pharmacy. After randomization as described above, patients will be assigned to one of the following two arms: esmolol for 24 hours or standard care (no esmolol). The primary endpoint will be improvement in the hemodynamic profile as measured by a decrease in the need for norepinephrine support. This will be defined as the difference in norepinephrine dose between groups at 6 hours after onset of study drug. Hemodynamics: Heart rate and blood pressure will be measured hourly for all patients for the full study period. Cardiac index and stroke volume will be measured continuously with the use of the Non-invasive Cardiac Output Monitor (NICOM) (Cheetah Medical, Oregon, USA) which is a validated tool for hemodynamic measurements in the critically ill.
Vasopressors: Vasopressor doses will be recorded hourly for the full study period. Additional measurements: At baseline we will collect pertinent variables such as demographics and past medical history. At baseline, 6, 12 and 24 hours after, trained research assistants will collect information on laboratory values and interventions performed by the clinical team (including but not limited to fluid administration, procedures, pharmacological intervention etc. ), ventilator settings, results of cultures, etc. Patients will be followed to hospital discharge and time on mechanical ventilation, length of ICU stay, length of hospital stay and mortality will be recorded. SOFA scores will be calculated at all time points. In a subset of patients who are mechanically ventilated, we will also continuously measure oxygen consumption for these patients via continuous VO2 monitor connected to the ventilator circuit. The study includes all adults resuscitated successfully with cardiopulmonary resuscitation (CPR) after an in-hospital cardiac arrest (IHCA), who have a lactate above 3 mmol/L and are on a mechanical ventilator after the arrest. Our overall hypothesis is that the administration of thiamine in post-arrest patients will increase global oxygen consumption and mitigate lactate acidosis. Change in oxygen consumption, as measured by a noninvasive monitor, is the primary outcome of this study. Specific Aim 1: To determine whether thiamine improves cellular oxygen consumption, attenuates lactic acidosis and increases private dehydrogenase (PDH) activity in post-arrest patients. Specific Aim 3: To determine whether intravenous thiamine improves clinical outcomes such as incidence of renal injury in post-arrest patients. In-hospital cardiac arrest is a major public health problem, afflicting over 200,000 persons in North America each year. Less than 50% of patients experiencing in-hospital cardiac arrest survive, and there is currently no medicinal intervention demonstrated to have a beneficial effect on post-arrest outcome. Thus, new therapies aimed at reducing the mortality and morbidity in post-cardiac arrest patients are essential. Low oxygen consumption is associated with worse outcomes in many critically ill states, and is thought to be due to dysfunction of aerobic metabolism. Pyruvate dehydrogenase (PDH) is a key gatekeeper to the Krebs Cycle, and thus aerobic metabolism, and thiamine is a co-factor of PDH. Inadequate PDH results in lactic acidosis (anaerobic metabolism) and an inability to metabolize oxygen effectively. We have shown that thiamine deficiency is common after cardiac arrest and that PDH is substantially inhibited in post-cardiac arrest patients, while lactic acidosis predominates – and failure to clear lactate is associated with worse outcome. In a randomized trial in septic shock, thiamine decreased lactate over time compared to placebo and survival over time was improved for those with thiamine deficiency. We hypothesize that the administration of thiamine in post-cardiac arrest patients will improve oxygen consumption and mitigate lactic acidosis. This phase II prospective, randomized, blinded, placebo-controlled single-center trial will investigate the effect of thiamine vs placebo on oxygen consumption, lactate and PDH in patients who achieve return of spontaneous circulation (ROSC) after IHCA. All patients will receive standard post-cardiac arrest care per their clinical team, whether or not they enroll in the study. Written informed consent will be obtained from the legally authorized representative. After consent and enrollment, the research assistant will inform the pharmacy of the enrollment and fax them a form with basic patient information and an indication of which lactate strata that the patient is in. After randomization and the initial blood draw, patients will be administered the study drug (placebo or 500mg thiamine) and will receive two daily dosages for 2 days. Blood sample collection: All patients will have blood samples collected at 0, 6, 12, 24 and 48 hours. Samples for lactate will be sent to on-site clinical laboratories for immediate analysis. Some blood will be analyzed using fresh samples. The remaining blood will be immediately centrifuged to separate serum and plasma. All samples will be aliquoted into light-protected cryotubes and will be frozen at -80ºC for future analysis. The 24-hour thiamine check will be used to verify correct randomization designation prior to data analysis. All blood will be drawn by ICU nursing from an existing line when present. In the unlikely event that a post-arrest patient does not have a central venous catheter or arterial line in place, trained research personnel (or the nurse) will perform a venipuncture for blood collection. Any surplus blood will be frozen and stored for future biomarker analysis that will include but not necessarily be limited to comparison of inflammatory biomarkers, metabolic biomarkers, and proteomic biomarkers. This blood analysis will not include genetic analyses. Global VO2 measurement: VO2 will be measured using a General Electric VO2 monitor with gas exchange module, which will be connected to the ventilator tubing via a ventilator adapter with an attached gas sampling line. The primary endpoint for this study is the difference in the change in VO2 over time between the thiamine and placebo groups. Lactate: We will check lactate at baseline, 6, 12, 24 and 48 hours, and compare the change in lactate over time between the two groups. PDH activity: We will measure PDH activity and quantity in PBMCs using a customized PDH activity and quantity microplate assay as previously described by our group. Thiamine Measurements: Thiamine levels will be checked at 0 and 24 hours to allow for a subgroup analysis of the thiamine deficient patients, and to ensure that thiamine levels rise as expected in the thiamine group. CPC-E score: The Cerebral Performance Category-Extended (CPC-E) score is a validated, clinically-feasible robust assessment of function and disability, providing more granular detail than the original CPC score. This will be done on each patient to assess for functional disability prior to hospital discharge. Description: a randomized, double-blind, placebo-controlled trial of ascorbic acid, hydrocortisone, and thiamine to improve outcomes in septic shock. Our overall hypothesis is that the administration of ascorbic acid, hydrocortisone, and thiamine in septic shock patients will mitigate organ injury through improvement in free radical reduction, immune function, endothelial integrity, and mitochondrial energy production. Specific Aim – To determine whether the combination of thiamine/ascorbic acid/hydrocortisone administered to patients with shock septic mitigates organ dyfunction as compared to placebo. Septic shock is a common and highly morbid condition affecting over 200,000 patients in the United States each year and resulting in upwards of 40,000 deaths. In-hospital mortality for patients admitted with septic shock has been has been estimated to be as high as 40%. While there is presently no recommended pharmacologic therapy specifically targeted at attenuating organ injury in septic shock, recent observational studies have found promising results using the combination of ascorbic acid (vitamin C), corticosteroids, and thiamine (vitamin B1). This medication combination has gained traction in the lay-media and is already being used by some hospitals to treat patients with sepsis and septic shock. Prospective testing in a randomized controlled trial, however, is needed prior to the widespread implementation of this therapy for victims of septic shock. This prospective, randomized, blinded, placebo-controlled multi-center trial will investigate the effect of ascorbic acid, hydrocortisone, and thiamine vs placebo on organ function in patients with septic shock. We will also evaluate other outcomes including mortality. Receiving vasopressor support (norepinephrine, phenylephrine, epinephrine, dopamine, or vasopressin)*Sepsis/Infection should be the suspected precipitant of hypotension requiring vasopressor support. All patients will receive standard septic shock care per their clinical team, whether or not they enroll in the study. After consent/enrollment, patients will have baseline labs drawn, and will be administered the study drug or placebo four times daily for four days (or until they leave the ICU). Blood and Urine sample collection: All patients will have blood samples collected at 0, 24, 72, and 120 hours, with testing as detailed below. Primary Outcome: The primary outcome will be the Sequential Organ Failure Assessment (SOFA) score. The SOFA score is a measure of organ dysfunction. The overall aim of this study is to determine whether the continuous use of neuromuscular blockade (NMB) can improve lactate clearance and clinical outcomes in comatose patients following in-hospital and out-of-hospital cardiac arrest (OHCA). Aim #1: Determine whether 24 hours of continuous use of NMB will attenuate 24 hour lactate levels in post-OHCA patients. Aim #2: Determine whether 24 hours of continuous use of NMB will improve clinical outcomes (length of stay, neurological outcome and in-hospital survival) in post-OHCA patients. Aim #3: Determine the effect 24 hours of continuous use of NMB has on global and cellular oxygen consumption as well as hemodynamics parameters. Aim #4: Determine the effect 24 hours of continuous use of NMB has on markers of systemic inflammation. Cardiac Arrest (CA) is a devastating disease process with high mortality and neurological morbidity. Unfortunately, we currently have little to offer other than supportive care. Specific to this proposal, the use of neuromuscular blockade (NMB) remains controversial and additional data is desperately needed to inform practice. The current study will provide necessary preliminary data for a larger phase III trial aimed at reducing mortality in post-CA patients. This intervention is already used in clinical practice and therefore the findings will be highly translatable and could easily be incorporated into clinical practice. Recently Nielsen et al. evaluated patients cooled to 33 °C vs. 36 °C and found no difference in survival or neurological outcome. This contradicted findings from two widely implemented 2002 trials showing an improvement in outcome in OCHA patients treated with 32-34 °C. The use of NMB was minimized in both arms of the Nielsen et al. study, (verbal communication with author) while NMB was used as boluses or infusions in both of the 2002 trials that found a benefit from therapeutic hypothermia TH. Thus, differences in NMB use in the treatment compared to control arms may have contributed to overall outcome differences. Newer studies provide evidence for a benefit of NMB, which will be clarified further by the current trial. Papazian et al. recently published a trial in which they randomized heavily sedated patients with early severe Acute Respiratory Disease Syndrome (ARDS) to cisatracurium vs. placebo for 48 hrs. The cisatracurium group had improved adjusted survival (41% vs. 32%) and more ventilator-free days (p < 0.05) without an increase in intensive care unit (ICU)-acquired myopathy. Alhazzani et al. conducted a meta-analysis of three trials using cisatracurium early in ARDS, and found an overall mortality benefit and no increase in ICU-acquired myopathy. Furthermore, the use of NMB has been associated with a decrease in pulmonary and systemic inflammation. In severe sepsis, Steingrub et al. 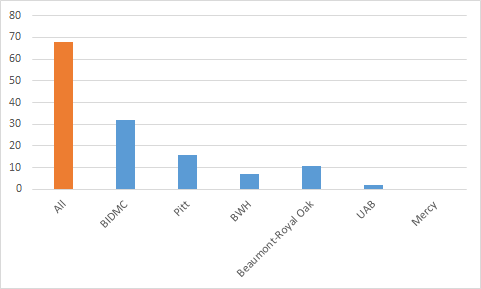 found that administration of NMB was associated with lower hospital mortality in a retrospective cohort study of 7,864 patients on mechanical ventilation where 1,818 (23%) were treated with NMB. Based on this emerging evidence as well as our preliminary data we hypothesize that NMB will be beneficial in post-CA patients. Prospective, randomized, human clinical trial. 1) NMB for 24 hours: Patients in this arm of the study will have NMB for 24 hours utilizing rocuronium as described below. At present clinicians at BIDMC arbitrarily sometimes use NMB and other times do not. Thus, the provision of NMB does not fall outside of current practice. 2) “Usual Care”: Patients will receive 100 mL of normal saline over 5-10 minutes at the beginning of the study in addition to usual care. When patients are enrolled in a clinical trial there is a time period from consent to study drug administration that depends on the investigative team, the research pharmacy, and the available nursing staff. In order to guarantee that this time interval is similar between the two groups the control arm will receive a small bolus of saline at the beginning of the trial. This will ensure that “time zero” is similar between the two groups which is essential in a trial evaluating a metabolic marker (lactate) that may change rapidly. Patients in this arm of the study will not be mandated to have NMB and the choice of whether to utilize will be per usual care. The decision for a “usual care” arm as opposed to mandated lack of NMB is for patient safety reasons. We do not wish to have a clinical scenario arise in which a patient should receive NMB but cannot because of being entered into this study. Therefore, while we anticipate the majority of patients in this arm will not have NMB, we recognize that some conditions may require NMB and they will receive them. Research blood will be used in the isolation of peripheral blood mononuclear cells (PBMCs) from blood: Plasma will be separated by centrifugation at 800g for 15min at 4°C and saved without disturbing the buffy coat. Then plasma will be replaced with the same volume of phosphate buffered saline (PBS). The cell pellets will then be mixed by gently pipetting up and down several times to disperse the cells. Next, PBMCs will be isolated from the PBS substitute blood samples using density gradient, Ficoll-Paque premium (GE Healthcare Bio-Sciences Corp). The isolated PBMCs will be used in the cellular metabolism and mitochondrial function analysis. Using the XF24 Extracellular Flux Analyzer (Seahorse Bioscience) we will simultaneously measure the oxygen consumption rate (an indicator of mitochondrial respiration), and the extracellular acidification rate (an indicator of the lactate produced e.g. anaerobic metabolism). First, PBMCs will be re-suspended in Dulbecco's modiﬁed Eagle's medium and seeded in a 24-well assay plate pre-coated with CellTak (BD Biosciences) and incubated at 37°C for 30 min to allow cells to attach to the bottom of the plate. Then the wells will be washed and 675uL of fresh XF assay buffer will be added to each well. The plate will be incubated at 37°C without Carbon Dioxide (CO2) for 1 hour prior to assay start. VO2 (volume oxygen or oxygen consumption) monitoring: VO2 will be measured using the General Electric Compact Anesthesia monitor with gas exchange module, which will be connected to the ventilator tubing via a ventilator adapter with an attached gas sampling line. This device measures VO2 continuously on a breath-by-breath basis, using an incorporated pneumotachograph to measure the volume of gas being exchanged and a paramagnetic analyzer to detect differences in inspired and expired oxygen. The patient’s ventilator settings with not be changed by our team, and a respiratory therapist will be present to connect and disconnect the monitor from the ventilator for the research physician or research assistant. Measurements will be carried out in the ICU where the patient is located. We will also measure cardiac output through the Cheetah Reliant Bioreactance-based non-invasive cardiac output monitor. Neurological outcome: We will use the modified Rankin scale to assess neurological outcome at discharge as recommended per recent American Heart Association (AHA) outcome guidelines. This is a validated scale, ranging from 0 to 6, commonly used in CA. Good and bad neurological outcome will be defined as a score of 0-3 and 4-6. Cardiac arrest (CA) occurs in more than 400,000 patients in the United States each year with an estimated mortality of greater than 90%. The majority of patients who are resuscitated from CA will succumb to the neurologic morbidity associated with the post-CA syndrome and ischemic-reperfusion injury. Currently, there are no pharmacologic agents known to offer survival benefit or to prevent devastating neurologic injury in post-CA patients. A potential therapeutic target following ischemia-reperfusion injury is mitochondrial function in the injured cell and/or reduction of oxygen free radicals. Coenzyme Q10 (CoQ10) is an essential mitochondrial co-factor and free radical scavenger that has been proposed as a neuroprotective agent in various neurodegenerative disorders as well as a cardioprotective agent. CoQ10 have furthermore shown exciting preliminary results as a potential therapy in post-CA. Prospective, randomized, double-blind, placebo-controlled phase II human clinical trial. Patients will be administered the study drug (placebo or 300 mg ubiquinol) and will receive two daily doses for one (1) week, the remainder of the in-hospital course, or until the patient has a normal neurologic examination. Neurological status will be assessed using the CPC-E score by the Principal Investigator and may be performed at any time prior to hospital discharge. Normal neurological examination is defined by a perfect CPC-E score of 30. The placebo will be pure Ensure (food/dietary supplement commonly provided to critically ill patients) and the ubiquinol will be mixed with Ensure for delivery and to allow for matching groups. The primary outcome will be blood CoQ10 parameters (total CoQ10, reduced CoQ10 and CoQ10 /cholesterol). Secondary outcomes will include biomarker measurements including but not limited to: cytokines, vascular endothelial markers, markers of neurological injury (NSE, S100B), oxygen consumption rates, and metabolomics markers. We will measure oxygen consumption and utilize in vitro inhibitors and stimulators of metabolism to further characterize samples including additional ubiquinol for the placebo arm samples. All patients enrolled in the study will have blood drawn at time 0 hours, 24 hours, 48 hours, and 72 hours. We will measure lactate at each time point through the clinical lab. In addition, blood samples will be analyzed for CoQ10 parameters either locally or by sending to an outside commercial lab likely the Department of Pathology and Laboratory Medicine at Cincinnati Children’s Hospital Medical Center (Cincinnati, Ohio, USA) using high-performance liquid chromatography. TRPPS: a randomized, double-blind, placebo-controlled trial of thiamine to improve renal outcomes in septic shock. Our overall hypothesis is that the administration of thiamine in septic shock patients will mitigate renal injury through improvement in mitochondrial energy production. Specific Aim #1 – To determine whether thiamine administered to patients with shock septic mitigates renal injury as compared to placebo. Specific Aim #2 – To evaluate the effect of thiamine on mitochondrial respiration during septic shock and to evaluate the relationship between mitochondrial respiration and biomarkers of renal injury. Septic shock is a common and highly morbid syndrome that affects over 200,000 patients in the United States annually and results in over 40,000 deaths. Renal failure is a frequent sequela of septic shock that is associated with notably worse outcomes. Thiamine (vitamin B1) is a critical component of aerobic respiration that may attenuate renal injury during septic shock. In a randomized trial, our research group has previously shown that thiamine deficiency is common in septic shock (35% of patients) and that the administration of thiamine to thiamine deficient patients with septic shock leads to reduced lactate at 24-hours. In a post-hoc analysis of that study, we have demonstrated that patients (both thiamine replete and thiamine deficient) who received thiamine had lower creatinine levels and were less likely to require renal replacement therapy. Thiamine, a key cofactor of pyruvate dehydrogenase, is a critical component of mitochondrial respiration without which a shift towards anaerobic energy production occurs. Thiamine is also a necessary component of the pentose phosphate pathway, which plays a role in reducing oxidative stress. Given the above, we hypothesize that the administration of thiamine to patients with septic shock will mitigate renal injury through resuscitation of mitochondrial function. This phase II prospective, randomized, blinded, placebo-controlled single-center trial will investigate the effect of thiamine vs placebo on renal function in patients with septic shock. All patients will receive standard septic shock care per their clinical team, whether or not they enroll in the study. After consent/enrollment, patients will have baseline labs drawn, and will be administered the study drug (placebo or 200mg thiamine) twice daily for 3 days. Blood sample collection: All patients will have blood samples collected at 0, 24, 48, and 72 hours, with testing as detailed below. Primary Outcome: The primary outcome will be the difference in creatinine (a marker of renal function) between the thiamine and placebo group. To study if vitamin B1 (thiamine) is able to more rapidly reverse diabetic ketoacidosis. Diabetic Ketoacidosis (DKA) is a potentially life-threatening disorder that may also expose patients to overt or sub-clinical morbidity. Even with optimal preventative strategies, a subset of patients will inevitably continue to develop DKA. Thiamine is an essential co-factor for several key enzymes of metabolism including pyruvate dehydrogenase (gatekeeper for Krebs Cycle). Thiamine deficiency is well known to result in lactic acidosis secondary to impaired aerobic metabolism and is a causal component of neurological and memory disorders, specifically the Wernicke-Korsakoff Syndrome. Moreover, glucose loading has been described as a precipitant of thiamine deficiency and we have demonstrated that metabolic stress can deplete thiamine levels over time. We hypothesize that the provision of intravenous thiamine to patients with DKA will serve as adjunctive measure to more rapidly reverse acidosis and will improve cellular oxygen consumption. Patients will be administered the study drug intravenously (placebo or 200 mg thiamine in normal saline) and will receive a dose every 12 hours for two days. The primary outcome is the change in bicarbonate over the 24 hours following enrollment. Secondary outcomes will include change in anion gap, change in lactate, ICU length of stay, hospital length of stay, and hospital resource utilization. Additionally, measurement of oxygen consumption in circulating mononuclear cells will be obtained as an index of whole body oxidative glucose metabolism. All patients enrolled in the study will have blood drawn at time 0 hours, 6 hours, 12 hours, 18 hours and 24 hours. We will measure bicarbonate at each time point through the clinical lab. In addition, blood samples will be analyzed for lactate, anion gap, albumin, and thiamine level. Overview: The purpose of this study is to see if mind-body approaches will help to reduce pain and suffering in people with chronic back pain. Mind-body approaches are behavioral treatments focused on breaking the pain-generating cycle between the mind and body. 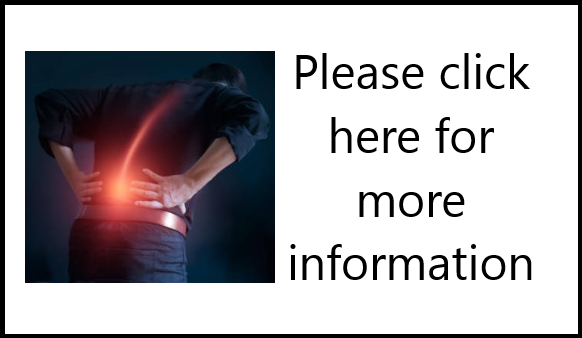 We are doing this study because people with chronic pain often continue to suffer after traditional interventions such as medications, surgery, and/or physical therapy. Other researchers have tried various approaches to teach those suffering from chronic pain how to break this vicious connection between the mind and body, with varying degrees of success. We intend to see if new approaches using a mind-body intervention will improve pain symptoms particularly when other therapies have not worked. About Our Benefactor: We thank Adam D'Angelo for providing the funding for this trial.